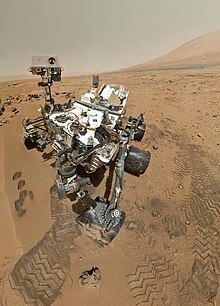 668 Martian sols (23 Earth months) primary mission. 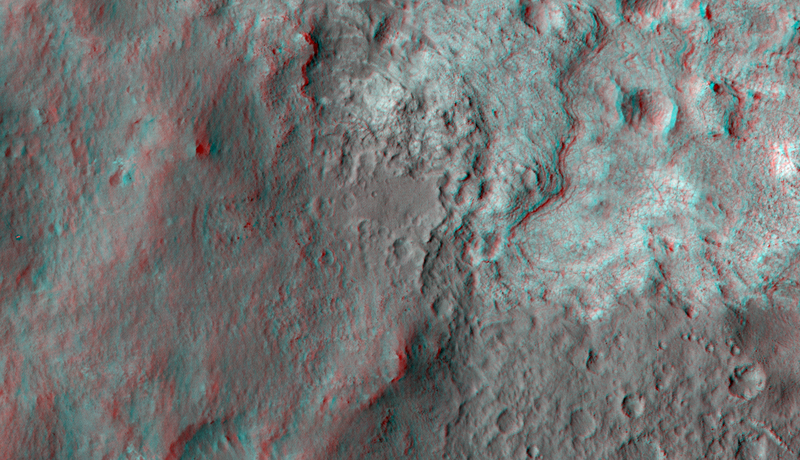 Rover's descent to the surface of Gale Crater in high-definition (August 6, 2012). Rover's landing site - first 360 color panorama (August 8/10vid, 2012). Rover's landing site and projected mission traverse track (narrated animation). Ejected Heat Shield (৪.৫ মি (১৫ ফু) diameter) falling away, as viewed by MARDI on Curiosity as the rover descended to the Martian surface (August 6, 2012 05:15 UTC). 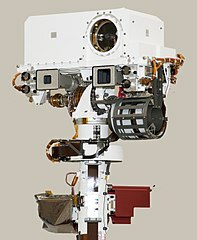 Calibration Target of the "Mars Hand Lens Imager (MAHLI)" (September 9, 2012) (3-D image). 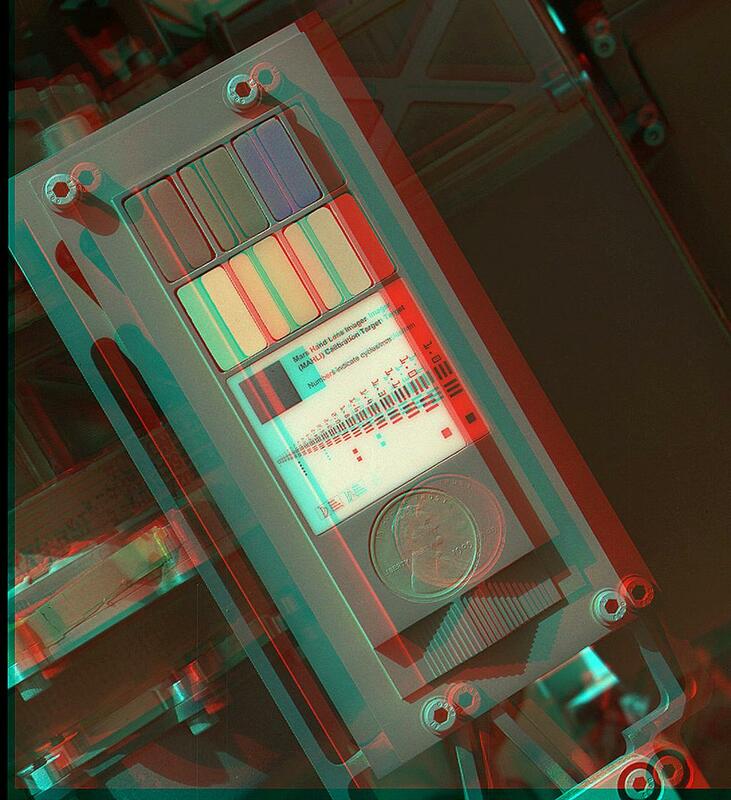 "US Lincoln Penny" on Mars - part of a Calibration Target on the Curiosity Rover (September 10, 2012) (3-D image). Wheels on the Curiosity Rover - "Mount Sharp" is in the background (MAHLI, September 9, 2012). Curiosity's tracks on first test drive (August 22, 2012) "parking" ৬.০ মি (১৯.৭ ফু) from original site ("Bradbury Landing"). Curiosity's view of Aeolis Mons ("Mount Sharp") (August 9, 2012) (white balanced image). Curiosity descending under its parachute, as imaged by HiRISE (MRO) (August 5, 2012). Curiosity's landing site (green dot) - Blue dot marks Glenelg Intrigue - Blue spot marks "Base of Mount Sharp" - a planned area of study. The MSL debris field viewed by HiRISE (MRO) on August 17, 2012. The parachute landed about ৬১৫ মি (২,০১৮ ফু) from the Curiosity Rover (3-D: rover & parachute). Map of Curiosity's route on Mars - moving east from "Bradbury Landing" toward Glenelg (Sol 56, October 2, 2012) (3-D version). Curiosity's view, from about ২০০ মি (৬৬০ ফু) away, of the Glenelg Area - an important science destination (September 19, 2012). Peace Vallis and related alluvial fan near Curiosity's landing ellipse and landing site (noted by +). "Hottah" rock outcrop on Mars - an ancient streambed viewed by the Curiosity Rover (September 14, 2012) (close-up) (3-D version). 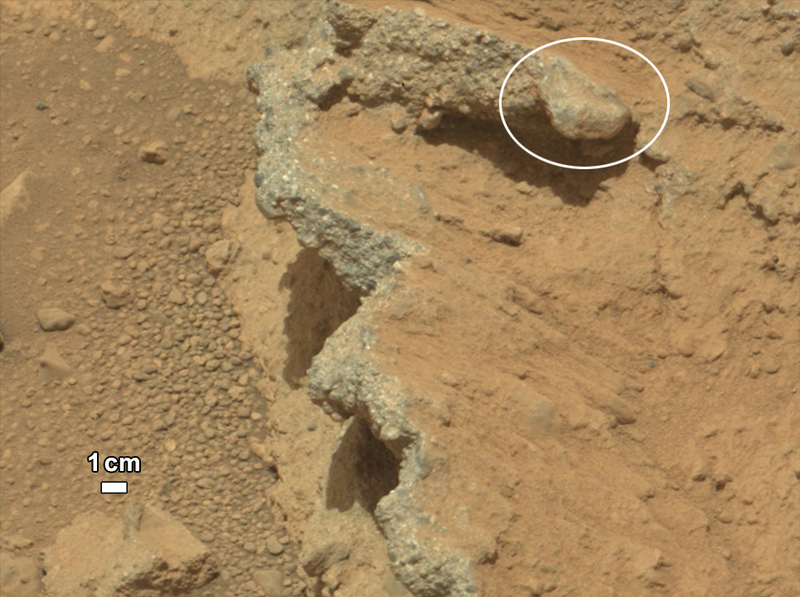 "Link" rock outcrop on Mars - compared with a terrestrial fluvial conglomerate - suggesting water "vigorously" flowing in a stream. Curiosity rover on the way to Glenelg (September 26, 2012).